Tennessee Counties: Bedford Co, Benton Co, Cannon Co, Cheatham Co, Coffee Co, Davidson Co, DeKalb Co, Dickson Co, Franklin Co, Gilles Co, Grundy Co, Hamilton Co, Hickman Co, Houston Co, Humphreys Co, Jefferson Co, Lawrence Co, Macon Co, Marshall Co, Maury Co, Montgomery Co, Perry Co, Rhea Co, Roane Co, Robertson Co, Rutherford Co, Sevier Co, Sumner Co, Stewart Co, Unicoi Co, Van Buren Co, Warren Co, Williamson Co, Wilson Co.
Tennessee is divided into 95 counties. A county is a local level of government smaller than a state and typically larger than a city or town, in a U.S. state or territory. As of 2000, Shelby County was both Tennessee's most populous county, with 897,472 residents, and the largest county in area, covering an area of 755 sq mi (1,955 km2). 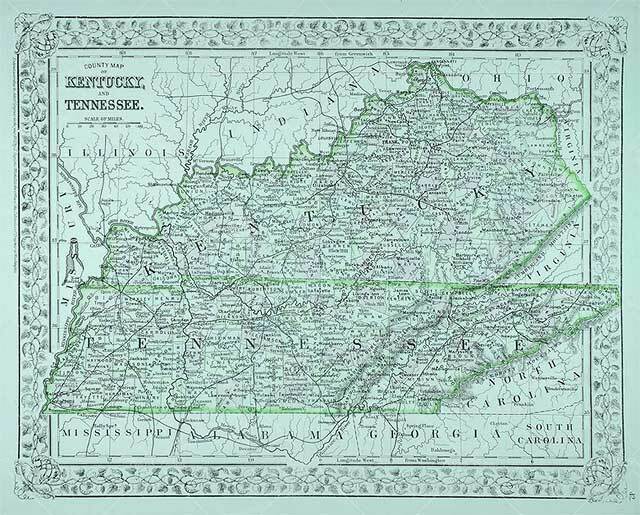 The least populous county was Pickett County (4,945) and the smallest in area was Trousdale County, covering 114 sq mi (295 km2). As of the same year, Davidson County, in which the capital Nashville is located, covers 502 sq mi (1,300 km2) with a population of 569,891. The population of the state of Tennessee as of the 2000 census was 5,689,283 in an area of 42,169 sq mi (109,217 km2). The oldest county is Washington County, founded in 1777. The most recently formed county is Chester County (1879). According to the 2000 census, the center of population for Tennessee was located at 35.795862°N 86.397772°W, 2.5 mi (4.0 km) south of Murfreesboro in Rutherford County. The center of population pinpoints the location at which the population of the state, as placed on a map of the state where they reside, would balance out the map. The geographic center, the point where the map of Tennessee would balance without the population, is located 5 mi (8 km) northeast of Murfreesboro. In 1976, the Rutherford County Historical Society marked the geographic center of Tennessee with an obelisk. Because today's largest county by area, Pike County, is 788 square miles (2,041 km2), it is now impossible to create a new county from a single existing county under the current constitution. Any county to be created in this manner will necessarily reduce the land area of the old county to less than 400 square miles (1,000 km2). It is still possible to form a new county from portions of more than one existing county (McCreary County was formed in this manner). The largest city in Kentucky, Louisville is a "consolidated local government" under KRS 67C. The second largest, Lexington, is an "urban-county government" under KRS 67A. Lexington and Fayette County are completely merged and there are no separate incorporated cities within the county. When the Louisville Metro government was formed, all incorporated cities in Jefferson County, apart from Louisville, retained their status as cities; however, the Louisville Metro Council is the main government for the entire county, and is elected by residents in all of Jefferson County. The Federal Information Processing Standard (FIPS) code, which is used by the United States government to uniquely identify counties, is provided with each entry, for Kentucky the codes start with 21 and are completed with the three digit county code. The FIPS code for each county links to census data for that county. Adair, Allen, Ballard, Barren, Breckinridge, Butler, Caldwell, Calloway, Carlisle, Christian, Clinton, Crittenden, Cumberland, Daviess, Edmonson, Fulton, Graves, Grayson, Green, Hansock, Hart, Henderson, Hickman, Hopkins, Livingston, Logan, Lyon, Marshall, McCracken, McLean, Metcalfe, Monroe, Muhlenberg, Ohio, Russell, Simpson, Todd, Trigg, Union, Warren and Webster counties are all in the Central Time Zone.